In its simplest terms, the internet is just a big marketplace made up of three players: storefronts, promoters, and customers. The customers are all of us: browsing, reading, watching, and clicking. The storefronts are also easy to see: Amazon, eBay, and an estimated 25 million other merchants peddling goods and services. The promoters are everything else. Every blog, Facebook page, video and piece of content serves one purpose: attract eyeballs and compel those eyeballs to click through to a pay window (be it their own product, or somebody else’s). Even passive promoters, like this blog, fit that mold. Adsense and other easy-to-use ad networks have made promoters out of millions of unwitting commoners. It’s a straightforward arrangement, and one that is nothing new to brick-and-mortar commerce. When I worked and lived in Manhattan, my crosstown trek home from Grand Central to Hell’s Kitchen ran right through Times Square. Every night a promoter would loiter the corner of 7th and 47th and berate male passersby into heading over to Cheetahs, a gentlemen’s club down on 43rd. His chant was mesmerizing, “Cheetahs fellas, Cheetahs. Beautiful ladies. Cheetahs. No cover. Cheetahs.” His elegant serenade must have worked, because he somehow made a living. The business card he handed out had a “No Cover” coupon on the front. And written on the back, in black sharpie, were his initials. These are critical elements. The “No Cover” is a promo intended to allure weak men into the red-glow of Cheetahs, and the initials let the club owner know who sent them–undoubtedly so he could pay the promoter a commission. On the internet, things haven’t changed much, except “No Cover” is replaced by a coupon code, and the handwritten initials are referral links and browser cookies which track who sent the customer and what they bought. We call this a “referral,” and the market for referrals is huge. Simple advertisements are your most basic referral. The customer clicks on a branded ad, but gets no special benefit. The website who promoted the ad will get a small click fee or commission. Ads, though, are largely ineffective. SmartInsights estimates that just 0.17% of ad impressions generate a click (or less than 2 clicks per thousand views). In other words, consumers have blinded themselves to banner ads. Banner ads are like a club promoter who hands you a business card with nothing more than a picture of a pretty girl and the club’s address. It’s very easy to ignore. So, promoters and merchants responded with a more enticing approach. Enter, coupon code websites. You know the major players: RetailMeNot and Savings.com. These sites are slightly more sophisticated promoters, appealing to consumers and driving clicks by keeping tabs on current merchant promotions. While these sites are often assumed to be little more than big banks of coupon codes, their revenues primarily come from retailer commissions when a user clicks an outbound link. 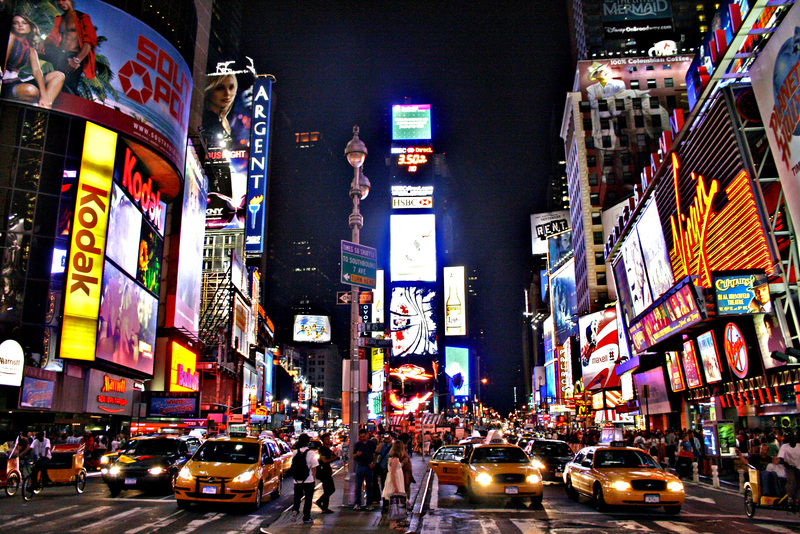 Circling back, RetailMeNot is exactly like Cheetah’s promoter in Times Square. There’s one major downside to this type of promotion. Sure, the customer saves a bit of money, but they don’t get a cut of the commission. “Listen buddy, I see you pass by here every night and you never take one of these cards. I get it…solid marriage, kids waiting for ya. C’mon, go check out these fine ladies. “I’ll level with you. The owner gives me $20 for every dude that shows up with one of my cards. It’s not a glamorous hustle but it pays for my scratch-offs. I tell you what, you bring me back an ATM receipt that proves you went to Cheetahs, and I’ll give you $10 out of that $20. How’s that sound? Here, take a card. I’ll be here all night. This arrangement is also known as a “kickback” and is generally associated with illicit behavior of Chicago politicians. However, in the world of e-commerce, it has become common (and legal). If you haven’t ever been to TopCashback, here’s the skinny. The site has affiliate programs with just about every merchant you do business with online: Amazon, Orbitz, Enterprise, Target, Lowe’s, and thousands of others. Even my favorite discount gift card resellers Raise and Cardpool are TopCashback partners. When you use TopCashback’s web portal to navigate to a merchant and subsequently make a purchase, your TopCashback account will get credited a percentage of the sale. The percentage varies by merchant, from 4% at WalMart to 65% at eHarmony. No matter the percentage, you can always be certain of one thing—TopCashback will always be the highest payer out there. Compare TopCashback rates to Ebates and others and you’ll find the returns are higher across the board. Let me provide a real-life example. I had to buy cabinets last week to finish our basement. I always keep a Lowe’s “10% Off” coupon in my wallet, just in case, but of course 10% off is never enough. I use the site constantly, now, and TopCashback has literally become the first place I go before I buy anything. An hour ago I had to buy a book for an upcoming semester of school. I found the cheapest book possible—it was on eBay for about $50. Because I linked through TopCashback, I got 1.5% back on the book (like 90 cents!). My company reimburses me for Becker’s CPA program–which is around $3,000. Just my luck, TopCashback is partners with Becker and provides a 10% rebate. Nice! An easy $300. My parents are furnishing their vacation home and were about to buy a washer/dryer using just a coupon code. I went ahead and purchased on their behalf, leading to another $60 in savings. TopCashback started in 2005, and I kick myself for not seeking out these rebates years ago. In the short time I’ve been using TopCashback (about a year), I’ve racked up $920 in cash. And, as illustrated in the Lowe’s example, using TopCashback doesn’t preclude you from using coupon codes and other discounts. In fact, TopCashback has tons of coupons built into its links, as well. It’s like RetailMeNot on steroids. Some merchants, however, won’t provide a rebate on purchases made using a gift card, so still exercise caution and read the terms on the merchant’s TopCashback page. Once your TopCashback account receives the credit for a purchase (2-6 weeks depending on the merchant) you can deposit the funds to a checking or PayPal account with no fee (and no minimum withdrawal). You can also have the funds put on an American Express gift card, which I always have done, because payouts to an AmEx Gift Card receive a extra bonus 3-6% (the exact bonus changes, but it’s always there). There is also an option for a retailer gift card, usually with a nice bonus (you can see, a Gap gift card offers a 5% bonus). However, I wouldn’t recommend doing that, it sort of defeats the purpose. Thus far, after dozens of transactions and three payouts, I’ve had zero “untracked” transactions and zero problems with payouts. Aren’t You Better Off Not Buying Anything? It’s true, nothing beats the old “100% Off” coupon of simply not buying in the first place. As with any of these little schemes, avoiding the purchase altogether is always the cheapest route. However, we are people, people sometimes need or desire things, and those things sometimes cost money. The point is, TopCashback partners aren’t a bunch of snobbish retailers with exclusively superfluous goods (e.g. Coach, 10% back). There are tons of legit, every-day establishments where even frugal folks shop now and then. If you want the link to TopCashback one more time, here it is. And, finally, I recognize this sounds like a desperate promotion for TopCashback. I hear a refrain of “Retire29 has sold out,” echoing around the internet. But, this is a lame promo, because I honestly believe TopCashback is a good, valuable tool for financial independence and savings. In conclusion, I don’t want anyone spending a single unnecessary dime. But, the fact is, dimes are still gonna get spent, so you may as well get some pennies in return. I love TopCashBack. We’re in the middle of renovating our kitchen and bathroom and we needed to spend a couple of weekends in a hotel. I went through TopCashBack to buy a Raise.com gift card for Hotels.com-and then went back through TopCashBack to book the hotel on Hotels.com. 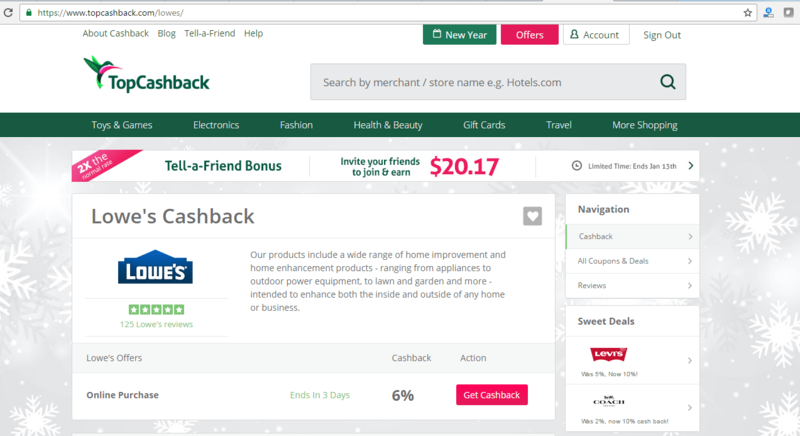 I ended up saving about $40-$50 between the gift card and TopCashBack in addition to earning free nights on Hotels.com. I was going to spend that money anyway, and was glad to be able to keep a few more bucks in my wallet. Upromise by Salliemae is 5% all the time for lowe’s, and on average is better from what I’ve seen.